The cyber cafe container houses a fully functional computer set up, comprising a thin client network of 11 monitors running off a standard Pentium 4 PC. UK charity Computer Aid has completed its first solar-powered cyber cafe capable of providing internet access to the most isolated communities in the world. 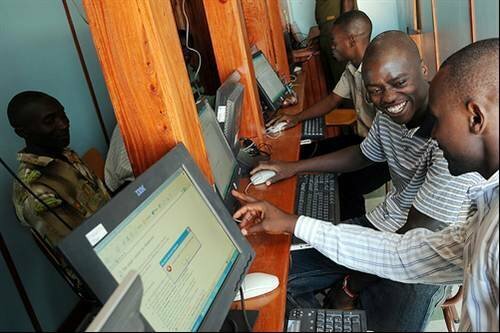 The cyber cafe, built inside a shipping container, was sent to Macha in Zambia to provide the community with internet access through Africa's largest rural Wi-Fi network. Over the past 13 years Computer Aid has professionally refurbished over 175,000 PCs for use in agricultural, health and education projects in more than 100 countries, predominantly across Africa and Latin America. To find out more about how to support Computer Aid through either donations of IT equipment or through corporate sponsorship, contact the charity directly on 020 8361 5540 or email enquiries@computeraid.org or visit: www.computeraid.org.